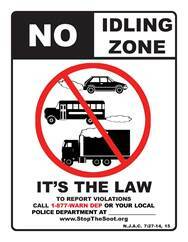 Order your No-Idling Zone sign suitable for installing on buildings, parking lots or anywhere that idling is a problem. 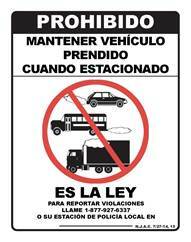 Signs are 12" wide by 18" high, made of highway grade aluminum reflective material, available in English and Spanish. Are you a school district or municipality and need alternate ordering instructions? Have a question about the status of order? Have general questions regarding the No Idling Signs, or our programs? Call Monica Miranda at (609) 292-7953.